Library of Congress, cw 0610000. HDQRS. ENGINEERS, DEPT. of N.C. AND SOUTHERN VA.
A detail of Gracie's Salient from the above map shows an interesting and often overlooked development. First, the Federals appear to have established a coehorn mortar battery (center highlight) on the far (west) bank of Poor or Taylor's Creek. 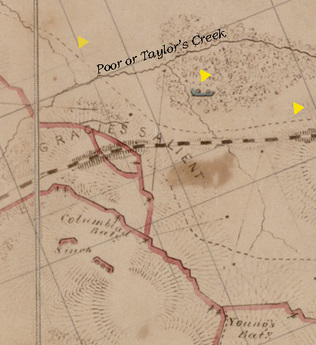 The aggressive Federal presence on this bank is further shown by a picket line (highlighted dashed line) that is pushed right up against Gracie's Salient and then continued south along the railroad. Federal proximity is also confirmed by the Confederate counter-mines that were built in front of Gracie's later in July. When did the Federals occupy this ground? From what we can discern from the documentary record, it must have been sometime on June 18th when Federal attacks swept over the southern flank of Hare House Hill. 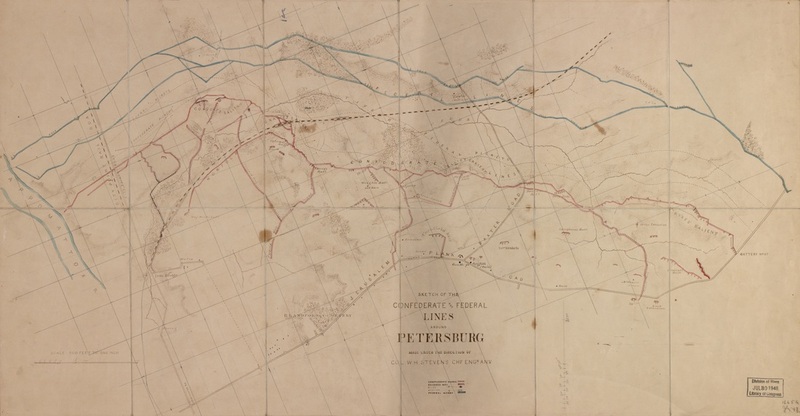 Behind the main Confederate line, the location of the 8-inch Columbiad can be found today. Although in rather poor condition, the configuration of the emplacement is unmistakable. Sketched in lines of fire, shows the great pains Confederate artillerists took to generate oblique and enfilade fires across the front of their position.